On thursday (2 Oct 08) I took a break from work and accompanied Wendy Potts from the Threatened Species Unit (DPIW) to the east coast on a hunt for the Eastern Eyebright (Euphrasia collina subsp. 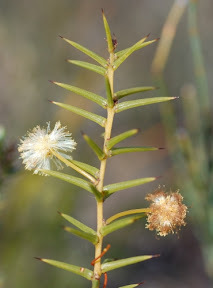 deflexifolia) (pic on left), a threatened species in Tasmania. This taxon is differentiated from the more common Tall Eyebright (Euphrasia collina subsp. collina) by having glandular hairs on the calyx. According to Wendy, some populations of the eastern eyebright flowered early and was worth checking up on. It was a long drive before we got to our first stop was at a heathland around Cole’s Bay. We stopped when Wendy spotted the eyebrights from the car. Thats the future of botanizing – superhuman botanists with bionic eyes which can spot threatened plants on a moving vehicle! We counted a few plants of eastern eyebright and also saw another two threatened plants, the Juniper Wattle (Acacia ulicifolia) (pic on right) and the Thick twistsedge (Caustis pentandra). Other highlights (non-threatened) were the Pine heath (Astroloma pinifolium), which I had only seen in the botanic gardens; the Turfed Lily (Thelionema caespitosa) and the Leopard Orchid (Diuris pardina). where there was a fenced enlosure of sandy heathland with a healthy population of the threatened Tasmanian Smokebush (Conospermum hookeri) (2 pics on left). We were also deligted to count at least 60 eyebrights. We proceeded next to a site around Georges Bay and located the exact GPS spot where there was an alleged report of the eyebrights. We found none. Could the eyebrights have perished from that spot? We did find another threatened plant however, the threatened Twiggy Guineaflower (Hibbertia virgata) (pic right). 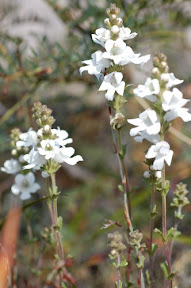 It had distinctive long flattened leaves. 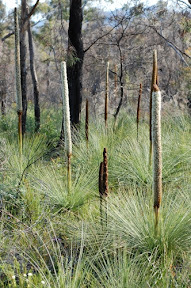 We were also graced with the sight of a large number of southern grasstrees (Xanthorrhoea australis) in full flower. Spectacular! 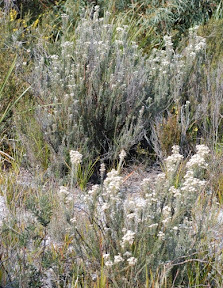 We drove on to a coastal heath area by the Gardens. Thats the furthest point in the Northeast I’ve ever been. By that time the sun’s angle was already getting low and we had a long drive home, but it was all worth it – at our last stop we found about 100 plants of eyebrights! By way of botanizing, there is so little that can be done in twelve hours on the East Coast. We can however, be happy with the sights we were graced with in just one day. We mused that botanists can spend their lifetime looking at plants. Indeed, I most probably will. 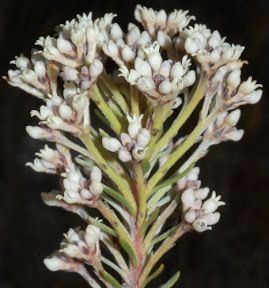 This entry was posted in Threatened Plants and tagged Acacia ulicifolia, Caustis pentandra, Coles Bay, Conospermum hookeri, East Coast, Eastern Eyebright, Euphrasia collina subsp. 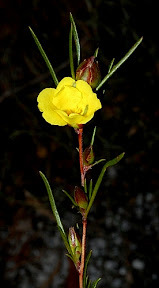 deflexifolia, eyebrights, Georges Bay, Hibbertia virgata, The Gardens, Threatened Plants. Bookmark the permalink.